Apple’s minor bug-zapping update for iOS 6, iOS 6.0.1, is already making up 7.5 percent of mobile web traffic as measured by ad network and analytics firm Chitika, just 24 hours after release. 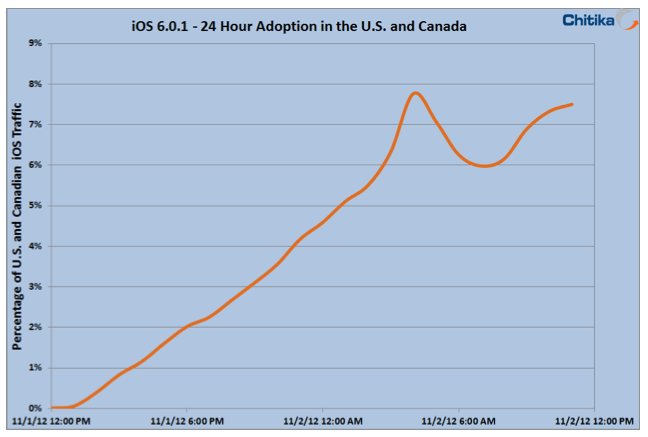 If you’ve been following, you’ll note that that’s just half of the 15 percent adoption rate iOS 6 saw a day after being in the wild. But this is a minor update, without anywhere near as much hype and fanfare as iOS 6, and 7.5 percent uptake is therefore impressive. For a more direct comparison, consider that iOS 5.1.1 took around a week to accrue a 12 percent adoption rate of iOS-based mobile web traffic, as measured by the millions of ad impressions seen by Chitika during any given 24-hour period. iOS 6.0.1 was available either through iTunes or over-the-air (despite a minor hiccup on iPhone 5 devices that required an additional install), which likely helped spur greater adoption, but that’s been the case since iOS 5 was introduced, so other factors are likely at play. 6.0.1 is the first maintenance update since iOS 6, and as such carries a number of bug fixes for well-publicized issues reported early by users who upgraded, including Wi-Fi connectivity bugs. The prospect of generally improved stability and performance likely drew a number of users to jump on board quickly, which could help to explain the relatively speedy adoption curve. Whatever the case, Apple appears to be doing a better and better job of getting all users on the same page software-wise even with minor incremental updates, which is good for the health of the platform as a whole.